For many students, science can be a difficult subject to master in school, especially when it comes to homework assignments. If you're struggling, keep reading to learn some tips to help you successfully complete your 7th grade science homework. With all the difficult terms and concepts your teacher will be presenting in class, it's highly important that you pay attention. Like other subjects, in science much of the content you learn builds on previous lessons and failing to pay attention can cause you to fall behind and become confused. If that happens, you'll find it extremely difficult to successfully complete your homework assignments. Therefore, make sure you're focused in class. To accomplish this, you may need to take notes or request a seating change. 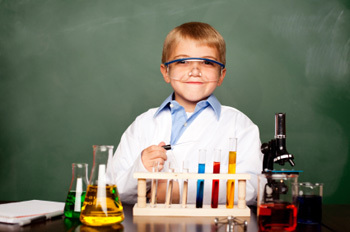 Due to the nature of the lessons in science classes, a good part of the class involves hands-on experimentation. This is usually accomplished through working in groups with other students. In addition, a lot of science teachers like to have interactive lessons and assign classroom projects. You'll do better in science overall and be more prepared for your homework assignments if you actively participate in these exercises. Since science can be a challenging subject, make sure you ask questions when you don't understand something. As stated earlier, if you don't understand the foundational material, you'll struggle to complete homework assignments properly. So, don't hesitate to ask for clarity or help. If you don't want to ask in front of the class, visit your teacher in the morning before school starts or speak with him or her after school. One component of science that causes many students to struggle is the vocabulary. Many students fail tests or homework assignments because they don't understand the scientific words in the texts or questions they read. Therefore, it's important that you spend extra time learning these challenging terms. One way you can practice vocabulary is to create flash cards. As you get stronger in your vocabulary knowledge, you'll tend to do better on your science homework assignments.